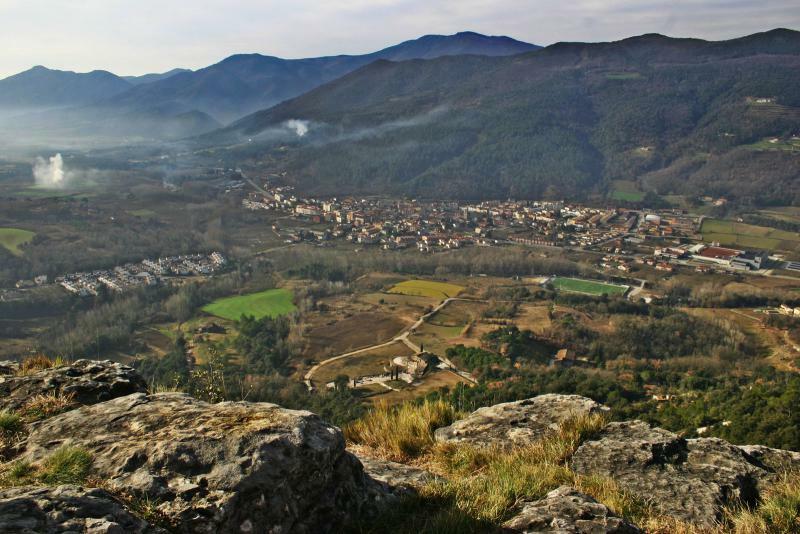 Inside the region of la Selva, very near to Olot and Girona, and with the river Brugent crossing it, Amer appears in the middle of a small valley (1). Covering nearly 40km2 and with nearly 2,000 inhabitants, this village, with a humid and temperate climate all year round, offers a wealth of nature characteristic to the area: holm oaks, oaks, pine trees, cork oaks, fields of cereals, vegetable gardens and hazels (2). There are also signs of the area’s historic heritage, such as the hermitage, the watch tower or the church (3). The valley of Amer proposes an endless list of ideas for activities to do in the open air, with the family or with friends, while also calmly discovering the historic centre, far from the crowds, but with the chance to enjoy activities such as concerts, the theatre or the cinema. Fishing in the river will be of interest for fishing fans: carps, barbels or trouts make their way round the river Brugent, just waiting for someone to catch them. Those who like to mushroom picking have woods at their disposal where local varieties such as níscalos, robellones, robezuelos or colmenillas can be found. Sweets are Amer’s star product: capricis (treats), rocs (rooks) and ametllats (macaroons), are biscuits typical to this village, which are prepared traditionally according to hundred-year-old recipes, as are the carquinyolis or pork rind cakes. The popular Castañada (a chestnut toaster competition) and the Festa del Pedreguet or of the aubergine demonstrate the gastronomic interest of Amer.